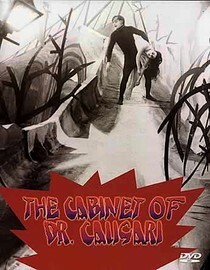 The Cabinet of Dr. Caligari is one of the first horror movies ever filmed. It centers around an evil hypnotist and a somnambulist. Yea, I had to look it up too. I've never seen that word used so much, ever. The story is decent but its just hard to get scared when there is no sound. What really shined through in this film was the set design. It looked like something out of a Tim Burton movie. There were absolutely no right angles in this movie, everything was just beautifully off-kilter. The sets are probably why I kept watching to be honest. That and figuring out what the hell a somnambulist is. Why is it in your queue? It has an awesome cover. Is it artsy? No, but it is a silent movie. Best thing about the movie? The sets are beautiful. What mood should I be in to watch this movie? In the mood to see pretty sets or a horror buff.